Late last night, Gwenn and I watched a Primetime special on Randy Pausch, a college professor who inspired millions of people with his words. Randy passed from pancreatic cancer this year, and here’s a clip of his famous “Last Lecture” from September of 2007. In my work with Gwenn, I get a lot of pats on the back for how I’ve handled my HIV diagnosis. But since speaking out, I’ve always looked back and thought that I had it easy, it was my parents who probably struggled the most. At 11, I just had some bad luck with my hemophilia treatments and was given one more excuse to stay home from school and pretend to be sick. But at 18, when I found out I had contracted hepatitis C from a blood product treatment, I remember being very worried. I wasn’t a kid anymore, I was finally a young adult, trying to figure out where I fit in. 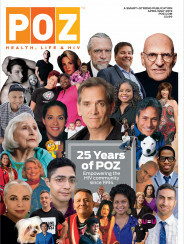 I was a year and a half removed from my decision to write and speak out about my HIV diagnosis, probably the biggest turning point of my life. The night that I got the news about hep C, however, I was thinking that this could be it. That I’d survived HIV for nearly half my life, only to contract this other virus that would be my undoing. It just seemed so sick. But the next morning? I woke up just like I’d done the day before. And among my first thoughts was: “If HIV couldn’t get me, then neither can this.” Being a realist, I figured that if it did, what good would worrying about it bring? In 2006, I was fortunate to get some good medical news about hepatitis. In twelve years, the virus had shown no signs of presenting a threat, and I was told I’d “cleared” hepatitis C. That I’d always test positive for antibodies, but I didn’t need to worry about it. Thankfully, that was a decision I’d made eleven years earlier. I guess what I’m trying to write, is that I wouldn’t trade my life for anyone else’s. And I think Randy Pausch, wherever he is now, would say the same thing about his own journey. And my hope is that you, whoever or wherever you are, feel the same way about yourself.